Home › News › Gang of Four: 25 years since their election, has change occurred? Gang of Four: 25 years since their election, has change occurred? 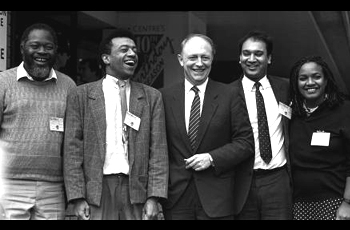 1987 was a pivotal year for Black and Asian equality in British politics. Four MPs: Diane Abbott, Paul Boateng, Keith Vaz and Bernie Grant were elected by their distinctive constituencies to represent them in the House of Commons. Their importance cannot be underestimated for two reasons. Firstly, before 1987, there had only ever been 4 non-white MPs throughout Britain’s parliamentary history. They were: Dadabhai Naoroji, Mancherjhee Bhrownagree, Shapurji Saklatvala and Jonathan Sayeed, elected on separate occasions spanning a period of nearly 100 years. Simply put, this was heralded to be the year ethnic minority representation kicked on. Twenty five years after the eventful day, we look on with hindsight to see if indeed ethnic minority representation has improved. Of the four that were elected in 1987: Diane Abbott, Paul Boateng and Keith Vaz have all held frontbench roles for the Labour Party and are still today very prominent in British politics (albeit Lord Boateng stood down in 2005 and is now a member of the House of Lords). Although never a frontbencher for the Labour party, Bernie Grant (who passed away in 2000) was a figure who openly stood up for the concerns of Black people. As Leader of Haringey Council, he vehemently defended his constituents in the Broadwater Farm riots and kept those values when he entered Parliament. He was ambitious for his community, and stood for deputy leader of the Party and also established and chaired the Parliamentary Black Caucus, designed to confront issues of race and race relations and promote the needs of BME communities. Abbott and Vaz also had the same firebrand vision. Both were members of the Black Caucus and never shied away from issues concerning BME communities. Vaz, currently the Chair of BAME Labour has called upon Parliament to introduce positive discrimination for ethnic minority candidates in a bid to eradicate the imbalance in representation whilst Abbott took the bold step in 2010 to stand for the Labour Leadership race and was the first Black woman to do so. Fast forward to today and sadly, this level of community commitment from the younger batch of non-white MPs appears to have simmered. Less immersed in community issues and more embroiled in political partisanship, the consequence appears to be further disenfranchising of Black and Asian people (in particular young people) who seem reluctant to participate in voting. Without casting their votes, BME communities are severely handicapping themselves and it should be here that BME MPs should be making a noticeable effort. Whilst it is true that the number of BME MPs has reached unprecedented levels at 28, even that is far below the requirement needed to reach equality on a proportion relatable to the non-white population. Therefore, it is not enough to be seen - Black and Asian MPs need to further raise the agenda by working closely with their communities in order to subjugate the level of ignorance that surrounds politics in our communities. The 1987 elections was a historic moment in the fight for greater ethnic representation, but it was not a defining one. Politics is not just governmental, it is to do with the power relations between one another and until our communities learn this we will always be second class. This is where the MPs step in. They need to be political beacons by constantly raising our issues in parliament; it is only once this is done that BME communities will truly achieve equality in our lifetime. Congratulations To The Gang Of 4. Submitted by Yinka Oyesanya (not verified) on Mon, 18/06/2012 - 09:18. Congratulations to the very brave Gang of four, who twenty five years ago took the very brave steps of stepping forward to open the very rusty padlocks of the House of Commons, and gave a voice to people like me in the United Kingdom today. There is still an arduous task ahead, but, nothing ventured nothing gained. Credit to the gang of four for taking those bold steps. Paul Boateng's harsh and very bad treatment while an MP in New Labour was greatly softened by Diane Abbott's bold and brave challenge for the leadership of Labour. The next step hopefully, will be to get Minority Ethnic citizens into key decision making positions in the British Government in the not to distant future. I have a dream that it would happen one day.